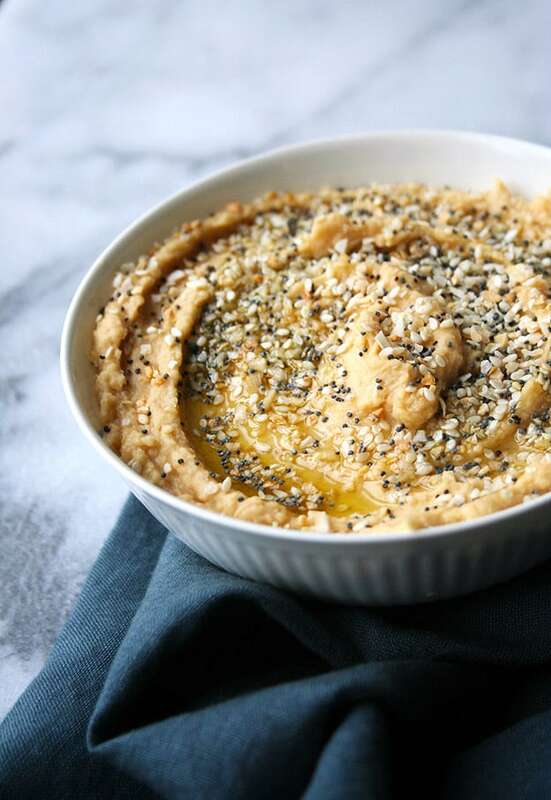 All the flavors of an everything bagel – garlic, onion, poppy seeds, sesame seeds, and salt – packed into this bowl of hummus. A bagel?! I didn’t even know they made bagels! Note: Clearly I have blinders on when I go in there because all I ever see is their cinnamon sugar pretzel donut. Wow – what self control! I don’t have the self control to buy a bagel from Stan’s when there donuts available. See note in #1. I have yet to try Stan’s everything bagel, but I decided that is wasn’t the bagel itself I was missing, just the spices. So I tweaked my classic hummus recipe to incorporate those flavors and BOOM, everything bagel hummus was born. I mean, look at all that flavor! All you need is pita chips or veggies and you’re ready to dig in! 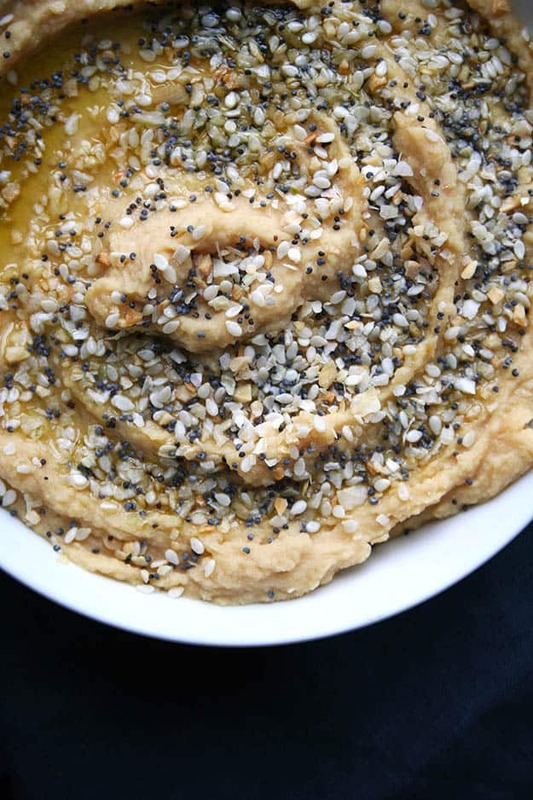 You won’t even miss eating bagels after you make this Everything Bagel Hummus! Well, you might but make sure to tell me what you think by posting on social media and using the hashtag #imhungrybynature! Place garbanzo beans, garlic, and salt in a food processor and pulse until broken down, scraping the sides as needed. Stream olive oil and toasted sesame oil into the food processor as it is running and process until it reaches your desired consistency. 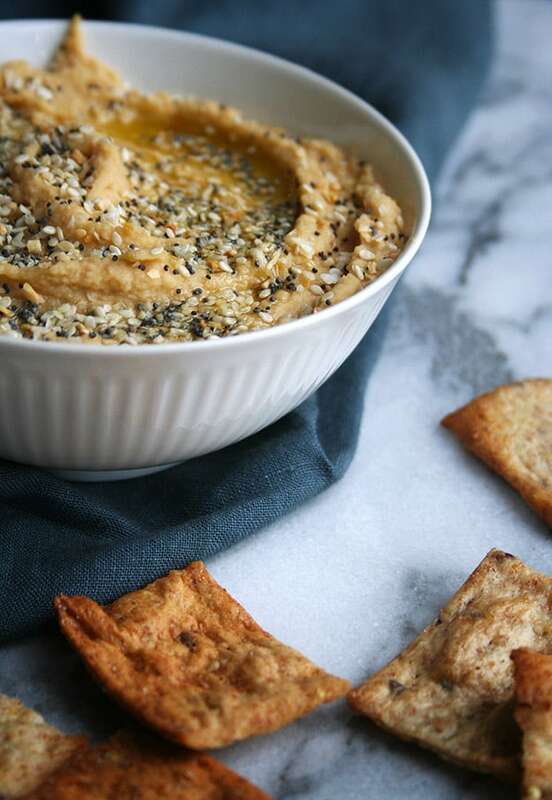 Place hummus in a bowl and drizzle with a little more olive oil. In a small bowl, mix together the sesame seeds, poppy seeds, minced onion, garlic and salt. 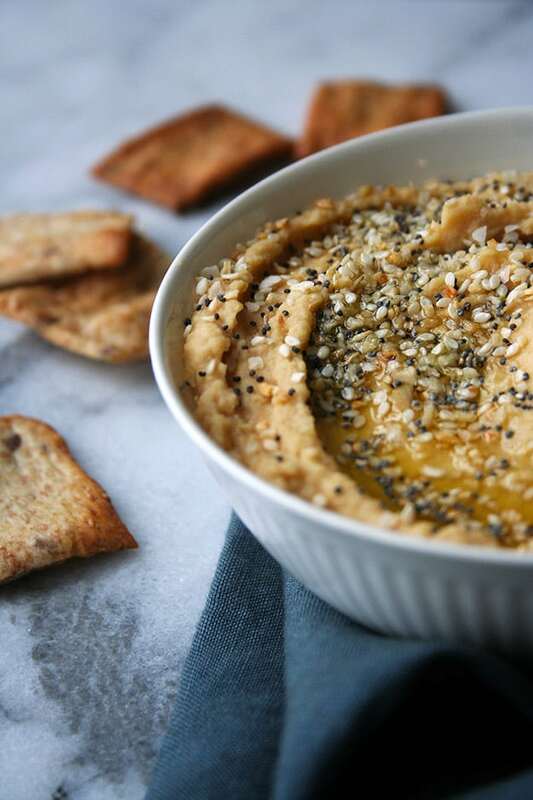 Top hummus with spice mixture and serve with pita chips! It’s just waiting for that perfect first scoop. Is it weird that I want to put this on a bagel? 😛 This seriously sounds so amazing!! And is beautiful. I just want to dive right in! Everything bagel hummus on and everything bagel?! Sign me up! I will most likely be purchasing one this weekend to make that happen. Ohhh! I love love love everything bagels plus I love hummus so this looks delicious! Thanks Mel! You will have to try it and let me know what you think!! yesssss, my favorite bagel was ALWAYS the everything one 🙂 This looks so yummy since I LOVE me my homemade hummus! Right?! It has to be everyone’s favorite 🙂 I hope you love it! Thanks Liz! If you make this, let me know what you think!! This may just be the most creative recipe I’ve ever seen! Stunning pictures- Can’t wait to try this! Thank you Diana – I hope you love it as much as I do!! Thanks Liz – I hope you love it!! I neeeeeeeed this hummus in my life! Yum! 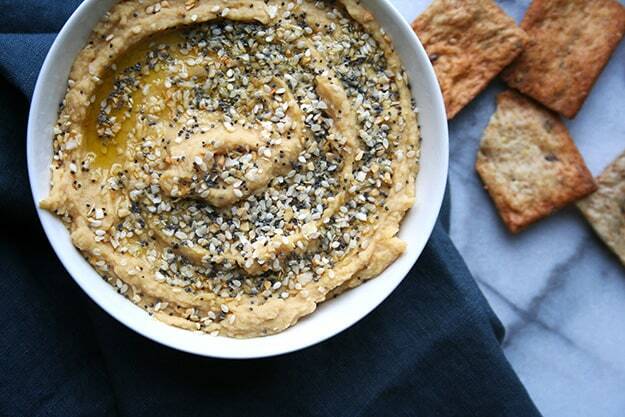 Omg all I can think about is dipping a toasty everything bagel into this everything bagel hummus!! Weirdly enough Stan’s calls their everything bagel a Mish Mosh. It was actually done by mistake and they just went with it. Think they said they were actually going for Mish Mash, or something. Well no matter what it’s called, count me IN! This looks like it would be extremely addicting and I don’t really like hummus. It is SO addicting Brandon! How long does this typically stay fresh in the fridge? My boyfriend loves the everything hummus we buy from the store, but there’s never enough leftover after he has a go at it- he’s been known to eat the whole lot in one sitting! SO, I have been gathering ingredients to make my own at home, based off your recipe and it’s simply DIVINE. I neglected to pick up dehydrated onions and garlic at the store, because I thought surely I had a pinch in the cupboard, but no- so I used fresh instead. I doubled the recipe and I’m glad I did, as I’m sure when BF gets home he will totally destroy it. Thanks for posting! Thank you Cait!! My husband does the EXACT same thing – literally will eat an entire tub of hummus at once. But I am thrilled you like it and I cannot wait to hear what your boyfriend thinks!! Made this as written and realized I should have drained the van if garbanzos. I omitted the olive oil to minimize the “soupy” texture. Couldn’t find fried minced garlic, so used fresh instead. I ended up mixing everything together & dunking pita in it. Very tasty & will make again, but next time will drain the garbanzos. They sell an everything bagel spice mix, so I picked that up yo sprinkle on top next time I make it. Would’ve been five stars if it had mentioned draining the garbanzos. Thanks Helen – I am sorry for the unclear instructions! They are updated now and I do hope you make it again!